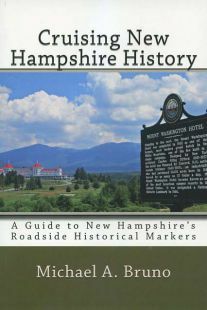 Cruising New Hampshire History: A Guide to New Hampshire Roadside Historical Markers, by Michael A. Bruno, 2018. A fascinating, thorough guide to the 255 distinctive green historical markers found along Granite State highways. Organized by region, then by town. For each marker the author provides a photo, the location, GPS coordinates, date of installation, and the historical story behind the marker. 564 pp., 6" X 9."